Register Log In GliderCENTRAL Forums Bonding & Relations Bonding question? Ok, I have had my gliders since July and they seem used to me. I mean, that they come on my arm, will sometimes eat on my lap, use me as a tree for tent time. My question is this: I tried letting them out of the cage only to have them run wild (very hard watching 3 gliders go in different directions). I have decided not to do this anymore and only have tent time. Will they ever get to the point where they will come to me without having to wait until they get to the point where they will come to me w/o having to chase them? I suggest tent time or sugar glider proof the bathroom. It will greatly help your bonding process. As Kimberly mentioned already, a small, safe, secure place would be the bet way to continue. Most likely after some time, yes, it's possible for them to come to you and hang out on you or come to you in an more open environment, but I would still hold caution as to where & when, making sure it's a fairly safe environment. Gliders typically don't come when called, and if they do, it can't be counted on 100%. I've had my Lulu and Skadoosh come to me at times when I call out for them*, but not consistently that I would trust in that completely. My Ollie boy never comes to me when called, but I haven't had him quite as long, he was older when I got him, and I didn't spend the same amount of "bonding" time with him before my life turned upside down. Out of my three gliders, probably Lulu has the best rate of coming to me when I call out to her, or she's scared. But I can reach down and pick any of them up most of the time when they're are out and about. *When I say "call out to them", I don't mean calling them like you would a dog exactly. I call out to them, yes using their name, tapping my shoulder or upper back if they're high up and can jump/glide to me, or have hands (open) on the floor if they're on the floor. Although lately, they all seem to be a little miffed at me for some reason and have not wanted to come out and play. OH, they'll come and take food or treats from my hand, but will not come out I may have disturbed their slumber a little too often recently though, perhaps that's why, can't be sure. Oh, when you do have to pick them up, please use the two-hand scoop method, coming in on each side. Do not go from over top, behind, or even reach from front. It's one hand on one side, palm up, the other hand on the other side of glider, palm up. Move slow and controlled, coming in from sides, low and underneath, scooping up the glider. Last edited by Terry; 10/03/17 09:25 PM. Thanks. I have the tent but maybe need to use it consistently. I have started trying to hold one (Athena) for an hour a day so she gets used to be held. Mine won't even let me pick them up but will let me pet them w/o any hassles. I guess I should get used to being a tree. I can't let them roam our house as there are too many dangers. I have the same issues with safety, unfortunately I also have issue with space for a tent (which I have) and I cannot use the bathroom the way I'd like to regularly enough (shared). So I set up an area around their cage which is in my bedroom (my only sole space available and it's tiny.) I have to limit my gliders to that area and have been working on creating an interesting space for them, but oddly after feeling I succeeded in doing so, they show very little interest in coming out anymore So my routine is dwindling back down to inconsistent, but not on my part. 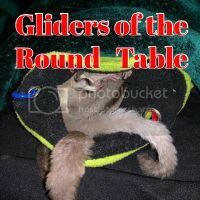 I think I replied to a comment about gliders not wanting to be held already, sorry I could go and copy and paste it if you'd rather not go back to refer to it, it's in another recent thread. Anyway, like I said in that reply, in short, don't be discouraged & don't expect more from your glider than he/she is capable of, over time, trust will grow to varying degrees at varying speed due to the specific glider. Just go with whatever your glider's limits are and keep it going. 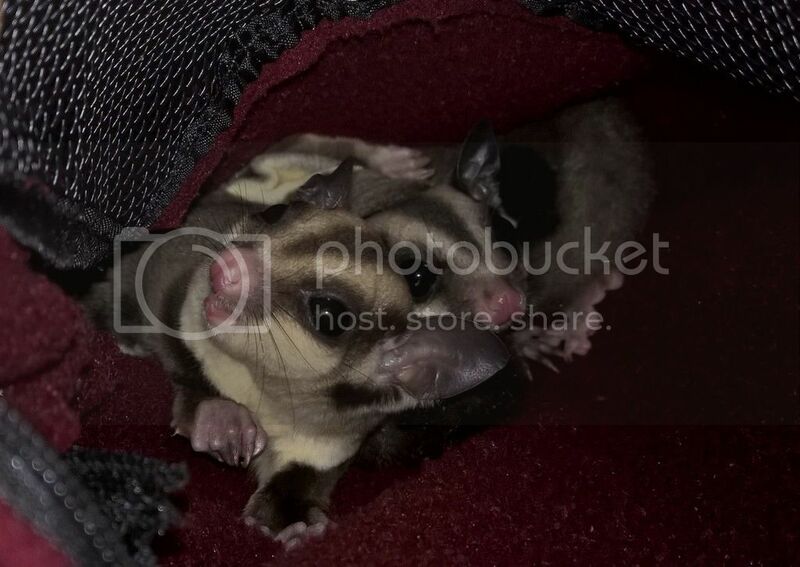 I've had my gliders for almost a year now (it will be a year in two days!) and I've come to expect that they will always come shooting out of the cage to bounce around the room as soon as I open the door. I give them space to explore on their own (as supervised as I can manage), but I also frequently hold out an arm to receive a jump whenever I catch their attention. They stay on me for a few moments, then jump off again. Also, have you tried spending time with your hand in the bag with the gliders while they're sleeping? I've found that to be a good way to get my gliders more used to my hands, so that they're not as skittish towards me during out of cage play time. Sometimes I can even get them to sleep in the palm of my hand in the pouch, which is so sweet! I guess I am jealous of those that have gliders that let them get them w/o running away. I tried the bathroom once and thought that I had found every little spot possible for them to explore. WRONG! Unbeknownst to me, our vanity had a small hole and Explorer decided to go in it. Both my son and I freaked out, cut out a hole where we could see (thinking it went into the wall). She wouldn't come out so I slept on the floor until I felt feet on me about midnight. After that, I vow only tent time.